We publish Office 365 for IT Pros in EPUB/PDF and Kindle (MOBI) versions. The first is available from Gumroad.com, the second from Amazon. We use the Caliber ePublishing software to generate the EPUB and MOBI files and generally our ePublishing workflow goes smoothly. Our EPUB files are good. After the files are generated, we check them using the Edge browser (which boasts a surprisingly good reader) and some free EPUB readers (like this one). We therefore have no idea why Google Play would complain about the file. We’re not the only ones with problems. Google’s own advice includes “If your file is an EPUB, try converting it to a PDF.” This tip is replicated elsewhere, as is converting the EPUB to MOBI and then back again to EPUB using an online file converter. I tried this method and it worked. However, I didn’t check the entire 37 MB EPUB to see if anything had been affected by the multiple trips through file formats. Google Play supports the upload and reading of PDF files. When you subscribe to the EPUB/PDF version of Office 365 for IT Pros, you can download files in both formats. Our recommendation is that if you want to use Google Play, upload the PDF file. Google Play doesn’t have the same issues it seems to have with the EPUB and the formatting of tables and code examples is better. 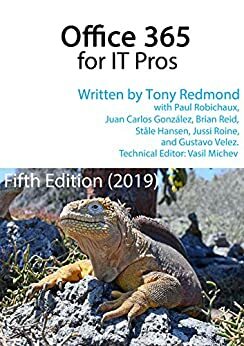 In fact, our recommendation for anyone interested in Office 365 for IT Pros is to use the PDF whenever possible as it will always be the best reading experience. Google sometimes has problems if the book contains too much pictures. That may be the case here. We do have a ton of pictures… Odd though that Google then accepts the book if it is converted to MOBI and back to EPUB… with all those pictures.